EDINBURG — Wednesday’s removal of a juror in the Monica Melissa Patterson capital murder trial highlighted a week of disruption. The matter in question was apparently resolved with the removal of the juror, who was instructed not to speak about the case until after its conclusion. Texas Ranger Robert Callaway, one of the lead investigators in the murder and theft cases against Patterson, then returned to the stand to detail his investigation into Patterson’s alleged role in the January 2015 death of Martin Knell Sr., 96. Callaway was first contacted by Knell’s former caregiver — Celestina Mascorro — in February 2015 when she came forward with allegations against Patterson. Mascorro told investigators that it was Patterson who instructed her to call 9-1-1 the day Knell was found unconscious; this after Mascorro said the defendant had previously been at his house earlier that same morning. Jurors heard the recorded phone calls and the meeting Callaway and his fellow investigators staged between Mascorro and Patterson over the course of the investigation. These recordings were in debate Monday about whether they should be entered into evidence. The recording of the in-person meeting was barely audible, however Patterson could be heard asking Mascorro if she knew “what cancer does to the body” and referencing the fatal heart attack Knell allegedly suffered. When it came time for defense attorney Ricardo “Rick” Salinas to cross-examine Callaway, he did not address the recordings and instead focused on 2015 federal tax liens the ranger collected during his investigation. The liens — which amounted to more than $300,000 — named both Patterson and Valley Speech Associates, her former company. Salinas then questioned why the ranger never investigated whether the status of the liens had changed over the past two years. “It would have been prudent for you to do that because … part of your case has been that she wrongfully received money, either from Mr. Knell’s estate or from Mr. Knell,” he said. The witness previously put this amount at approximately $600,000. The attorney often sparred with Callaway during the cross-examination. Salinas took issue with Callaway’s repeated description of Knell’s death as a “murder” as well as his use of “egregious” to describe expenses Patterson allegedly made with Comfort House funds — this while she served as the McAllen nonprofit hospice center’s administrator from 2014 until her August 2015 arrest. The defense maintains these expenses were the result of a misunderstanding between Patterson and Comfort House as to what the administrator could and could not spend money on. “In the context of the conversation you and I are having today, egregious means a Safelite Auto receipt for $400 for a windshield that the Comfort House does not own,” Callaway explained. He also said he used the word “murder” because his “investigation shows Mr. Knell was murdered,” which led Salinas to question the ranger’s objectivity in the case in addition to whether Mascorro was considered a suspect. Callaway, who maintained his objectivity, noted Mascorro had been a potential “target” during the first months of the investigation. 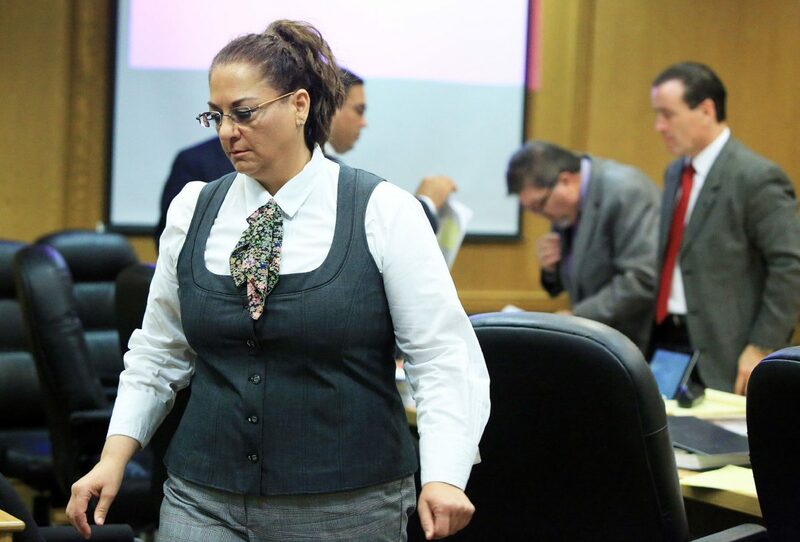 Before the judge dismissed the jurors for the day, Salinas laid the groundwork for evidence the defense plans to present of text messages between Patterson and Mascorro on the day of Knell’s death.